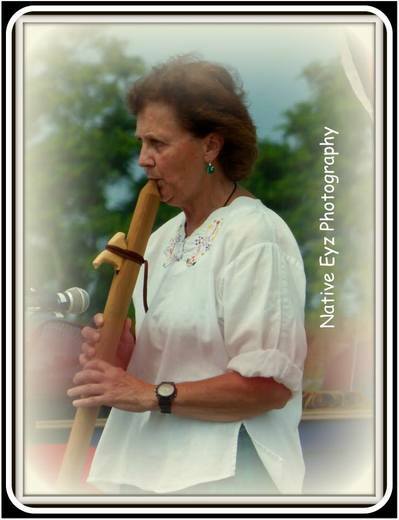 Dail is well known for her Native American flute playing in the New England area. She is Native American and her heritage is Huron, Wyandotte and Micmac.. Her gifted Native American name is "Dragonfly". Gifted to her by 3 elders on 3 different occasions. She loves dragonflys so is very honored by this gifted name and deeply touched by it. Dail makes her living as a Nurse Practitioner. She has recently returned back to guitar and vocals and songwritting and is loving it!! Dail's flutes have a beautiful voice and speak well to what's in her heart, but her own voice makes her feelings more accurate and clear to the listener. Dail loves simple blues and jazz. Dail's vocal songs reflect winning or loosing lost at love or speak to how she feels about this world. She loves to start out with a few phrases of a song and then just start playing her guitar and see where it leads her. She plays her flutes this way too. All of Dail's Flute CDs are improvised at the recording studio never knowing what will happen until she starts playing and letting her flute take her on a journey. It is truely a remarkable experience. Dail is now spending a lot of time on new songs with her guitar with most of the influence being concentrated on folk style. A lot of work is ahead of her, but she is looking forward to it !! Most of Dail's CDs can be purchased on CD baby. You can also go to her web page freespirit-music.com to buy them. Well, she hopes you enjoy her music and as always, thanks for listening.